Since its inception, the ‘Killer Squad EP’ was going to be undeniably huge. Featuring some of the most resounding names across drum & bass, it’s a meeting of titans bringing together the scene’s most mind-breaking production standards. Using these collaborations to pedestal their extensive experience across all musical platforms, this EP is a monumental landmark for Teddy Killerz journey. Up first, sees a return of the formidable Teddy Killerz and June Miller super group. Deviating from the sound of their last joint single release and demonstrating the vast repertoire they’re able to tap into, it’s a driving riddim which ducks, dives and dashes between breaks. Unrelenting with rave-style reece and a stocky baseline taking you forward, it’s the perfect starter for what’s yet to come. ‘Sputnik’ sees Teddy Killerz partner with historical figurehead Gridlok, who heads up this nitty roller underpinned with distorted bass and lofty stabs. 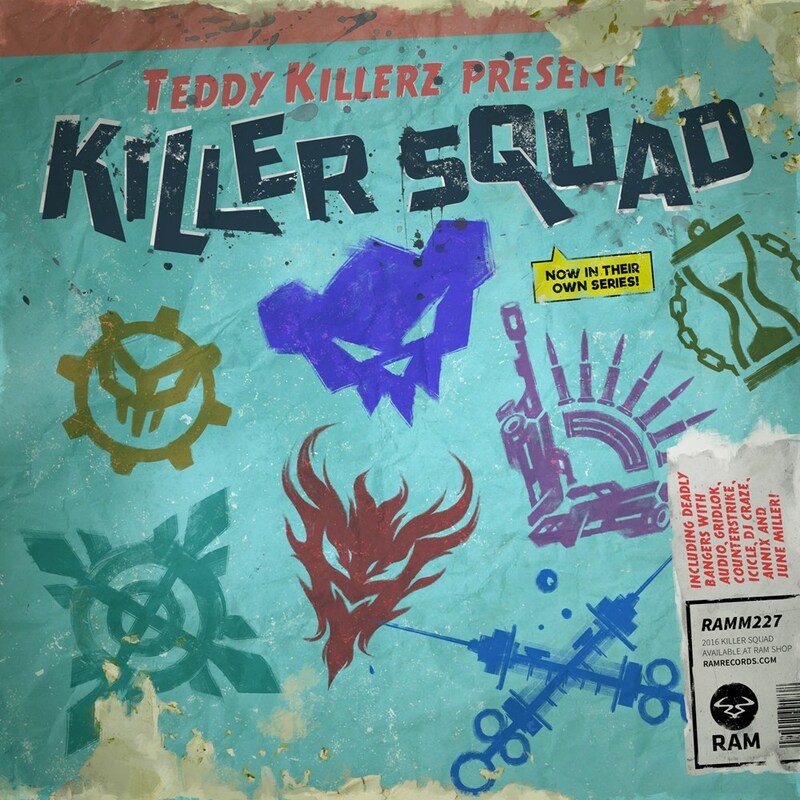 Teddy Killerz bring their techy, crunching personality amongst systematic breakdowns and elevating beat patterns. Nefarious, yet ingeniously built, ‘Sputnik’ will take you into the morning’s earliest hours. The merging of Teddy Killerz and Audio’s fearsome talent brings expected results, but they’re no less devastating. Flipped samples and clanking percussion dip between reverberating kick drum. Nastily slick, ‘Bugs’ is robotic in design and remorseless in its application. Then comes the enormity of Icicle’s brooding, cleverly progressing dynamic for ‘Louder’, which rolls out next. It’s lumbering yet tight in its composition, proving the Eps versatility whilst also demonstrating why Teddy Killerz brought Icicle on board. Amongst chaotic pits of LFO, it’s stocky and clanking, adding more weight to the track listing. The long awaited Annix collaboration announces itself. Angry, undiluted and the type of jump up which detonates any drum & bass, this fresh cut explodes on impact. Sophisticated yet littered with warbling synth and percussion which acts as a call to arms, it’s a dancefloor anthem for the globe most notorious spots.